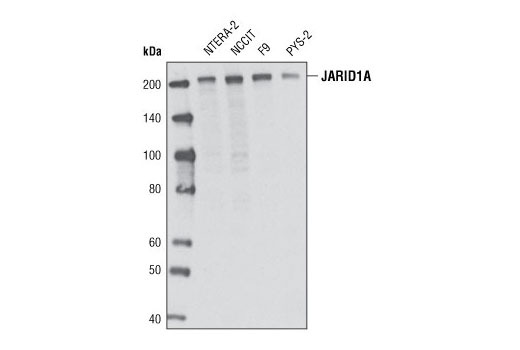 Western blot analysis of extracts from various cell lines using JARID1A (D28B10) Rabbit mAb. 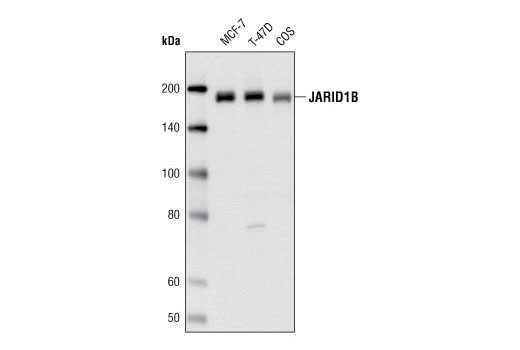 Western blot analysis of extracts from MCF-7, T-47D and COS cells using JARID1B Antibody. 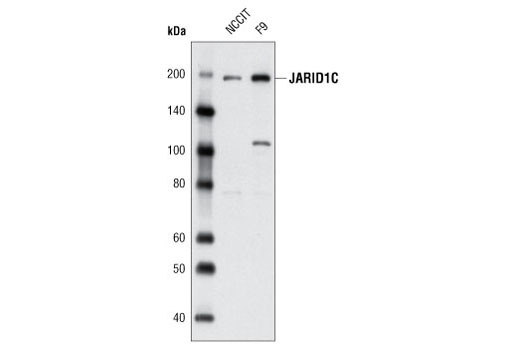 Western blot analysis of extracts from NCCIT and F9 cell lines using JARID1C (D29B9) Rabbit mAb. 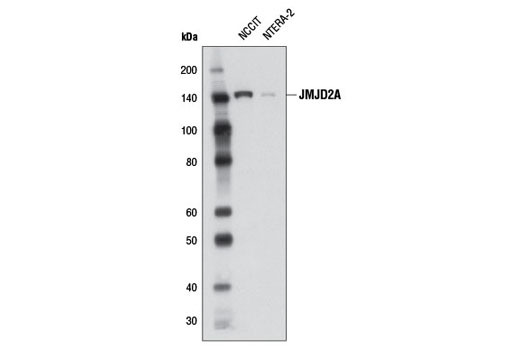 Western blot analysis of extracts from NCCIT and NTERA-2 cell lines using JMJD2A (C37E5) Rabbit mAb. 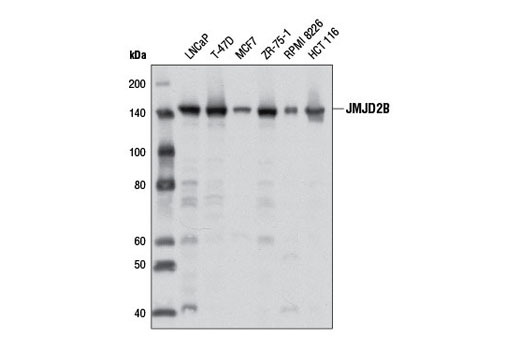 Western blot analysis of extracts from NCCIT cells using JMJD1B (6A1-1F5) Mouse mAb. 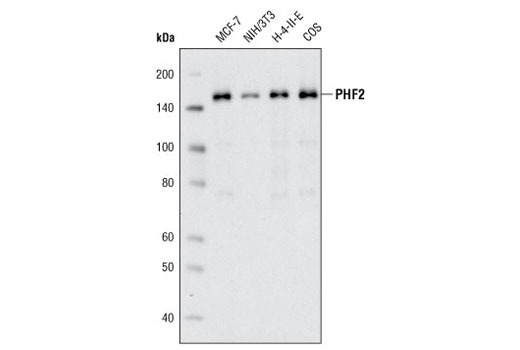 Western blot analysis of extracts from various cell lines using PHF2 (D45A2) Rabbit mAb. 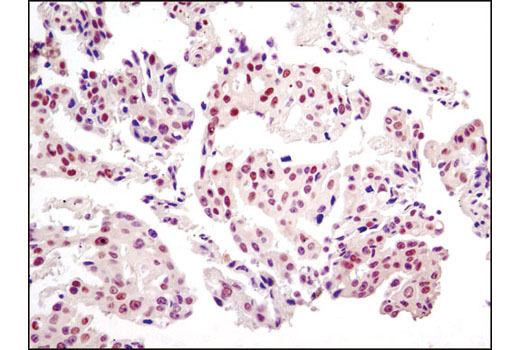 Immunohistochemical analysis of paraffin-embedded human lung carcinoma using JMJD2A (C37E5) Rabbit mAb. 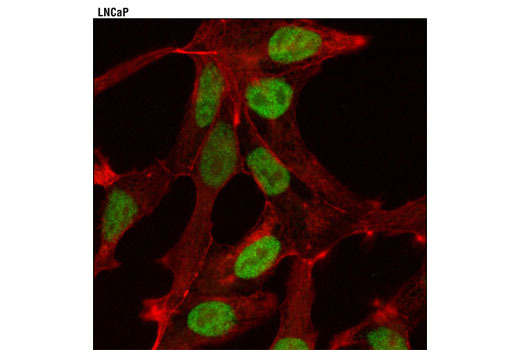 Confocal immunofluorescent analysis of HeLa cells using JMJD1B (6A1-1F5) Mouse mAb (green). 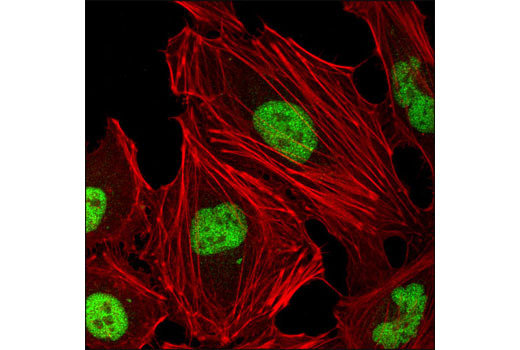 Actin filaments were labeled using DY-554 phalloidin (red). 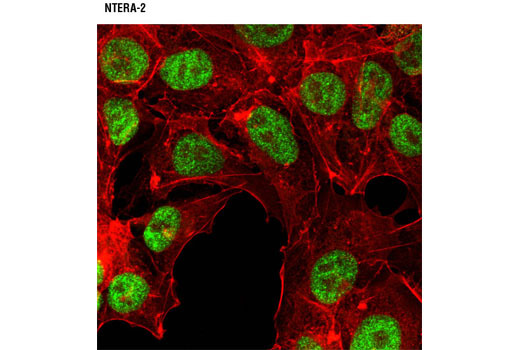 Confocal immunofluorescent analysis of NTERA-2 cells using JMJD2A (C37E5) Rabbit mAb (green). Actin filaments were labeled with DY-554 phalloidin (red). 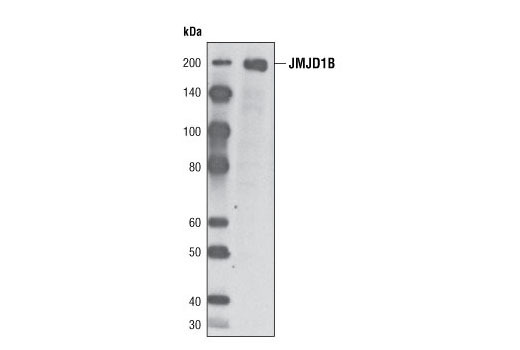 The Jumonji Family Antibody Sampler Kit provides an economical means of evaluating total levels of Jumonji family proteins. 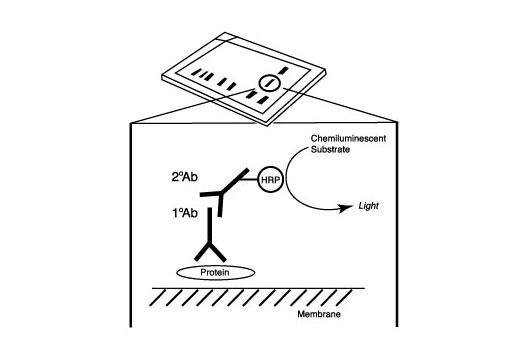 The kit contains enough primary antibodies to perform two western blot experiments with each primary antibody. Each antibody in the Jumonji Family Antibody Sampler Kit detects endogenous levels of the respective target protein. Jumonji C (JmjC) domain-containing proteins represent the largest class of potential histone demethylase proteins (1). The JmjC domain can catalyze the demethylation of mono-, di-, and tri-methyl lysine residues via an oxidative reaction that requires iron and α-ketoglutarate (1). Based on homology, both humans and mice contain at least 30 such proteins, which can be divided into 7 separate families (1). The JMJD2 (Jumonji domain-containing protein 2) family, also known as JHDM3 (JmjC domain-containing histone demethylation protein 3) family, contains four members: JMJD2A/JHDM3A, JMJD2B/JHDM3B, JMJD2C/JHDM3C, and JMJD2D/JHDM3D. In addition to the JmjC domain, these proteins also contain JmjN, PHD and Tudor domains, the latter of which has been shown to bind to methylated histone H3 at Lys4 and Lys9, and methylated histone H4 at Lys20 (2,3). JMJD2 proteins have been shown to demethylate di- and tri-methyl histone H3 at Lys9 and Lys36, and function as both activators and repressors of transcription (4-9). JMJD2A, JMJD2C and JMJD2D function as coactivators of the androgen receptor in prostate tumor cells (5). In contrast, JMJD2A also associates with Rb and N-CoR corepressor complexes and is necessary for transcriptional repression of target genes (6,7). JMJD2B antagonizes histone H3 Lys9 tri-methylation at pericentric heterochromatin (8). JMJD1B is a more widely expressed family member and is frequently deleted in myeloid leukemia (10). The JARID (Jumonji/AT-rich interactive domain-containing protein) family contains four members: JARID1A (also RBP2 and RBBP2), JARID1B (also PLU-1), JARID1C (also SMCX), and JARID1D (also SMCY) (11). In addition to the JmjC domain, these proteins contain JmjN, BRIGHT, C5HC2 zinc-finger, and PHD domains, the latter of which binds to methylated histone H3 (Lys9) (11). All four JARID proteins demethylate di- and tri-methyl histone H3 Lys4; JARID1B also demethylates mono-methyl histone H3 Lys4 (12-14). JARID1A is a critical RB-interacting protein and is required for Polycomb-Repressive Complex 2 (PRC2)-mediated transcriptional repression during ES cell differentiation (15). A JARID1A-NUP98 gene fusion is associated with myeloid leukemia (16). JARID1B, which interacts with many proteins including c-Myc and HDAC4, may play a role in cell fate decisions by blocking terminal differentiation (17-19). JARID1B is over-expressed in many breast cancers and may act by repressing multiple tumor suppressor genes including BRCA1 and HOXA5 (20,21). JARID1C has been found in a complex with HDAC1, HDAC2, G9a, and REST, which binds to and represses REST target genes in non-neuronal cells (14). JARID1D is largely uncharacterized. PHF2 contains a JmjC domain, which may play a role in histone demethylation (1). Hu, Z. et al. (2001) Oncogene 20, 6946-54. Benevolenskaya, E.V. (2007) Biochem Cell Biol 85, 435-43. Christensen, J. et al. (2007) Cell 128, 1063-76. Yamane, K. et al. (2007) Mol Cell 25, 801-12. Tahiliani, M. et al. (2007) Nature 447, 601-5. Pasini, D. et al. (2008) Genes Dev 22, 1345-55.
van Zutven, L.J. et al. (2006) Genes Chromosomes Cancer 45, 437-46. Secombe, J. et al. (2007) Genes Dev 21, 537-51. Barrett, A. et al. (2007) Int J Cancer 121, 265-75. Dey, B.K. et al. (2008) Mol Cell Biol 28, 5312-27. Barrett, A. et al. (2002) Int J Cancer 101, 581-8. Lu, P.J. et al. (1999) J Biol Chem 274, 15633-45.